It is impossible to imagine modern web development without the use of Chrome DevTools. Thanks to a clean UI and continuous improvements to meet real-world needs, the tool has become the go-to live development environment that surpasses many contemporary IDEs in both functionality and performance. But how productive are you with the DevTools in your daily development workflow? I’d like to share some of my favorite shortcuts that will help you master the tool. You can quickly open the DevTools by simply hitting the F12 key. In most cases though, you also want to inspect an element on a page. There’s a special shortcut that gets you there even faster: hitting Ctrl+Shift+C will open the DevTools and invoke the inspector tool. I don’t know about you, but every time I use this shortcut, I feel like a professional gunslinger! A typical development cycle consists of modifying files on your system and reloading the page to observe the results. How many times have you observed that your saved changes don’t show up, only to later realize that it was due to caching? Do yourself a favor and toggle one important option: "Disable cache" in the Network tab. Done. Productivity increased, confusions reduced. And don’t worry, this option only applies to the current page and is only active when the DevTools are open. I find myself needing to use the console quite often for quickly manipulating the DOM elements, analyzing the current variables during debugging, or executing functions from the app. Thankfully, I can bring up the console without leaving the current DevTools tab by pressing ESC. A great advantage of using the DevTools is the ability to edit the state of your app "live," which means you will immediately see your changes without having to reload the page. You can modify element attributes and content right from the Elements panel by double-clicking on the item you want to change. Note that you can not only change the attribute values but also the attribute names or even element tag names. To add a new attribute, right-click on an element and select "Add attribute." Drag and drop elements to move them within the document. Cut/copy/paste elements using the standard Ctrl+C, Ctrl+X, Ctrl+V. Press Del or Backspace to delete the selected element. Press H to show/hide the selected element. Messed things up? Hit Ctrl+Z for undo, Ctrl+Y for redo. Over 10 years ago, the innovative text editor Sublime Text popularized the "Goto Anything" pattern. Combining a clean UI, fuzzy string searching, and keyboard shortcuts, it allowed users to instantly jump between files, symbols, projects, and lines or even invoke different commands. The feature proved to be so valuable that it was adopted by other software. Chrome DevTools was no exception, and hopefully you already know that you can quickly go to any source file by pressing Ctrl+O and typing a part of its name. You don’t even need to be on the Sources tab! But did you know you can "go to" other things too? 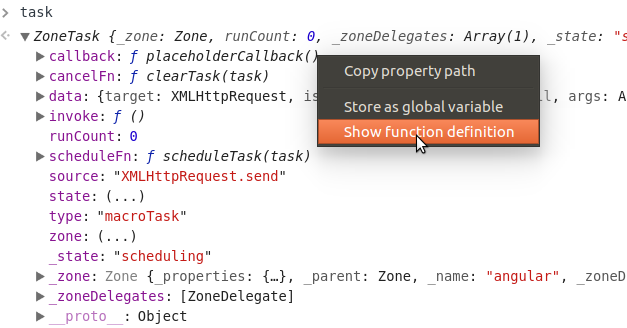 A more recent addition is Ctrl+Shift+P, which allows you to switch between DevTools panels. Note that the list includes all panels: the standard ones like Elements, Network, and Console as well as the less visible ones like Rendering, Performance Monitor, Changes, Coverage, or Request Blocking. I find this shortcut very handy, as I can never remember how to open all these extra panels with a mouse. What? You had no idea these panels even existed? You’re welcome! Similarly, when inspecting a reference to a DOM element, you might want to find out where that element lives on the page and what styles are applied to it. The "Reveal in Elements panel" feature does exactly that. A new major stable version of Chrome comes out every 1-2 months, and each version comes with new features that both end users and developers can get excited about. 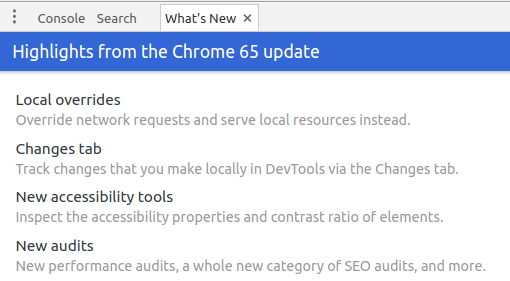 It’s not easy to stay on top of all the latest and greatest with such a rapid release cycle, so recent versions of Chrome have been incorporating a handy "What’s New" panel in the DevTools that highlights a handful of important changes. The panel automatically pops up in the DevTools Drawer every time Chrome is updated to a major new version and stays there until you close it. If you close it accidentally, you can always reopen it via the Ctrl+Shift+P keyboard shortcut that you just learned! To stay updated on the latest news in Chrome and Chrome DevTools, follow the Google Developers Web Fundamentals blog. What are your favorite DevTools tricks? Share in the comments. Thanks for collect usefull DEVTOOL features in one place! I didn’t know about “Go to … anything” feature, but “Pretty print” is my favorite. Do you have any idea why Google keeps “disable cache” instead of “enable cache” as default? Thanks for the comment Eugene! To answer your question about “disable cache” — I think the reasoning here is that the standard browser behavior should be preserved by default, unless explicitly overridden by the developer. While disabling cache is preferred when actively modifying web resources during develomnent, this is only one among many scenarios of using the DevTools. Hi and thanks for this write up. Note that ‘Show function definition’ appears in the context menu only from the console, *not* the debugger. (at least on chrome 68 & 70).